Should A Game Console Make Moms Feel Less Guilty About TV Time? Will products like the XBox Kinect play a positive role in our children’s development? Lady Geek CEO Belinda Parmar explores the future of edu-tainment. 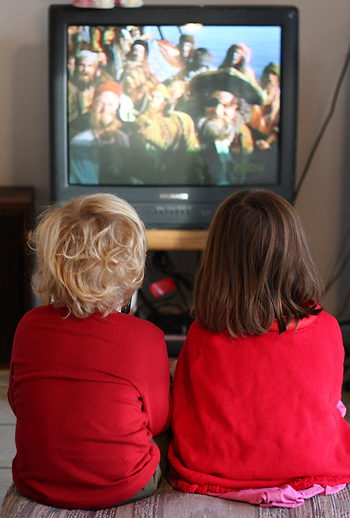 I hate the feeling I get when my kids watch TV. When I see them slumped there, zombied out in front of the screen, it’s so hard not to feel guilty. I should be doing more to get them out of the house. Pump them full of fresh air. I imagine many parents feel the same. So I wasn’t sure how to greet the news that Xbox is making a big push into the educational market with its new ‘playful learning’ range of Kinect titles aimed at 4-10 year olds. Of course I could see that the Kinect’s controller-free interface might encourage kids to use their bodies and motor skills to engage with subjects. But the guilty parent in me couldn’t help but worry–might this just another way for us to abdicate responsibility, to plonk our kids in front of a screen and tell ourselves that were doing our job? With the American Academy of Pediatrics warning parents to limit screentime, especially for infants and toddlers, it’s tough to justify. It’s ok, I tell myself. It’s educational. But then something surprising happened. As the scarily passionate Microsoft team began to show off the new titles, I could feel that, in spite of myself, I was softening. The Kinect really is a wonderful piece of technology that is intuitive and immersive, and the new games take full advantage of its abilities. As I watched the demonstrator and her child enthusiastically navigate round a virtual Sesame Street with a series of wonderfully fluid physical gestures, I was amazed when they both appeared within the game itself. I couldn’t help but think that what I might be looking at was the future of learning. It can be easy to dismiss something as bad for our kids because it involves staring at a screen. All parents do it, and it’s impossible to shake off our natural prejudices that children should be outside hopscotching and bike riding and scraping knees as if it was a Beverly Cleary book and a stash of hidden pirate gold depended on it. But we have to embrace the fact that our children are being raised in a brave new technology age and my 3-year-old daughter–similar to the baby in the video–thinks a traditional magazine is a broken iPad. Products like the Kinect can and will play a huge part in their future development. With its immersive interactivity, the experience becomes as much about kids teaching themselves as it is about being taught. They no longer have to sit and listen, but can get up and participate. Its no longer about passively sitting in front of the TV, but jumping in and learning with them. It’s wonderful. Maybe I’m being optimistic, but if used to its full potential–and the Xbox demonstration I witnessed showed me that this is entirely possible–I see no reason why Xbox, the darling of the ‘traditional’ gamer, could change moms’ perception and win the Battle of The Living Room. But it won’t happen overnight and is going to take serious commitment from Xbox to understanding a new audience, and in particular Mom, the CEO of the household and the ‘gateway to the living room.’ Xbox clearly knows this. “We are listening. We are learning along the way and writing each page as we go,” said David McCarthy, Xbox General Manager for Kids and Lifestyle Entertainment. Titles like Kinect Sesame Street and Kinect National Geographic TV can let kids learn how to count along with Elmo, explore the wonders of nature as a bear or experience their favorite book from within the story itself. To me, that’s incredible. We have entered a new era where my children’s imaginations are augmented by technology, and I can’t help feeling what I saw will revolutionize the way our children learn. Please join the Lady Geek campaign to end the stereotypes and cliches towards women in tech and like us on Facebook. @belindaparmar is the founder of @LadyGeekTV.